Your inbox is probably filled to the brim with advice on onboarding. There are two reasons why this topic is hot right now: record employment levels and some pretty alarming facts about first-year voluntary turnover rates—particularly among millennials. While there’s plenty of research on turnover rates, which can run as high as 50 percent in the first year, you’ll find a surprising lack of research to support specific onboarding program ideas. To do a better job of retaining new employees, we need to develop a better understanding of what they really want from employers. Our latest ebook, written by Jeff Gelinas, VP of People at Engage2Excel, offers practical onboarding ideas based on what employees really want. These easy-to-implement ideas are based on Jeff’s 15 years of experience in onboarding new employees as well as groundbreaking research by Engage2Excel from a 2016 Trendicators survey of nearly 1,500 job seekers. One of the problems we all face daily is that there are simply too many ideas out there for improving HR processes and practices, but nowhere near enough time to implement even a fraction of what comes across our desks. Step 1. Take five minutes to read through the ebook. Step 2. Pick three ideas that fill gaps in your current onboarding program. Step 3. Present these three ideas at your next HR meeting with recommendations on how to divide up the responsibility for implementing them. Step 4. Check in with the designated implementers in 30 days to gauge and encourage progress. Looking for Support for Your Onboarding Program? 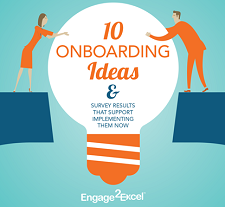 Our employee engagement experts here at Engage2Excel can help you design, manage, and implement an onboarding program that will have a measurable impact on retention rates in the first year and beyond. To schedule a discovery call, click here.